By Mike Hubbartt, © Copyright 2011, All Rights Reserved. When I returned to college to earn my undergrad degree in Computer Science in 2007, I was surprised to see how many students used their smart phones in school. I started on a Masters degree (MS in SE) in the Fall of 2010 and was surprised to see how many students have embraced mobile devices to help with classwork. With the release of the iPad 1.0 product, I’ve seen little or no use of netbooks on campus, and huge numbers of students using mobile devices to access and retrieve information while studying and in classrooms. I bought a iPod Touch in March and have to admit I’m hooked. The apps I’ve tried look and function very well, so I was pleased to see Wolfram Research releasing course assistants for students. For the 3 or so readers that are unfamiliar with Wolfram Research, they have been selling Mathematica for many years. Over the course of the product life-cycle they have constantly added functionality to their powerful software. Many universities provide Mathematica for their students at low or no cost, and it is a fantastic product for Math, Engineering, and Science majors. I started using Mathematica 5 and have enjoyed using and reviewing versions 6 and 7 for MacWorld UK, and I cover 8.0 (and 8.0.1) on this blog. Sky Orientation, Moon, Physical Astronomy, Light and Telescopes, Starlight and Atoms, The Sun and Stars, Black Holes, Cosmology, Solar System, and Life on Other Worlds. This category has data on: Constellations, Zodiac, Reference Points, Basic Angles, Degrees to Right Ascension, Angular Diameter, Size Comparison, Seasons, Periapsis/Apoapsis. My favorite option was the size comparison, where you compare 2 astronomical objects. My least favorite option was Seasons, where you look up the nearest solstice/equinox for a specified date. The moon is one of my favorite bodies to observe as it is so close that many features can be seen with binoculars. I liked everything in this category, which covers moon phases, lunar and solar eclipses, and the tides. I checked out the most recent solar eclipse yesterday, and it was yesterday (May 20), although it was not visible from many places as it was primarily seen over the Atlantic ocean. This section covers Newton’s Laws, Newton’s Second Law, Circular Orbit Velocity, Stationary Orbits, Escape Velocity, Moment of Interia, Rotational Angular Momentum, Kepler’s Laws, Kepler’s Third Law, Kepler’s Third Law with Mass, and Relativistic Energy. All are good to have when taking an astronomy or physics class, but my favorite was escape velocity where you can compute this information for astronomical bodies based on radii of AUs, kilometers, miles, meters, and feet. Mass is set using kilograms, pounds, or grams. Very useful. This section covers materials useful for building or using telescopes. It uses eyepiece focal length and objective focal length to determine telescope magnification. I also like how it calculated light gathering power, so you can compare 2 telescopes (very handy when you decide to purchase your next telescope). There were a few options I really liked, but don’t see a need for the Temperature Conversions as this is fairly simple to calculate and I’ve seen the conversion formulas in more than a few intro programming books. My two favorite areas in this category were the Stellar Spectral Classes (determine the property of stars using class/subclass/luminosity) and the Relativistic Doppler Effect (determine speed of a light source using wavelengths). Good stuff! A ton of information about our sun and stars. It is useful being able to compute the physical properties of the sun based on distance from the surface. The Star Properties section of the category provides properties for Sirius, Canopus, Arcturus, Rigel Kentaurus A, Vega, Capella, Rigel, Procyon, Achernar, Betelgeuse, Hadar, Altair, Acrus, Aldebaran, and Spica. The type of data returned for each star was useful, however I’d rather have a dynamic list of stars pulled from Wolfram’s servers than a fixed, hard coded list. How can you not be interested in one of the most powerful objects in the known universe? This category provides a means to calculate Schwarzschild Radius, Hawking Temperature, entropy, surface gravity, surface area, and gravitational redshift for black holes. Excellent information, especially for students. This category lets you calculate the wavelength of an object that is red shifted. Nice, but I wish there were more sections than the 3 that are provided. Some good, quick reference information on bodies in our solar system. I particularly liked being able to retrieve images of the planets – you first retrieve a thumbnail image and can select a larger image if you want. I like how much amount data you can retrieve on our solar system bodies. I did use some of the data in the Dwarf Planets section when I wrote my piece on Dwarf Planets (see the Astronomy page of this blog for more information). This category consists of inputs to compute the Drake Equation, which accepts various data to yield the probability of life on other worlds. Very handy. 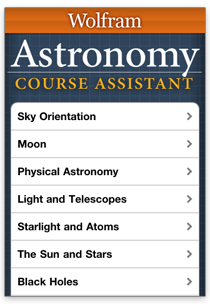 Wolfram has 6 course assistant apps available for the iPhone, iPad, and touch. I tested this app using my touch and was satisfied with the amount of useful information as well as the content layout. I would like to see fewer hard-coded lists in future releases, as Wolfram’s data source servers are excellent sources of materials and I’d love to have the capability of this (and other) apps expanded without needing to download an updated version of the app. I had no crashes or errors when testing, although 1 time I had a timeout when attempting to retrieve an image of Mercury. As much as I enjoyed this app on my iPod touch, I’d love to see it on an iPad. A good buy for reasonable price. 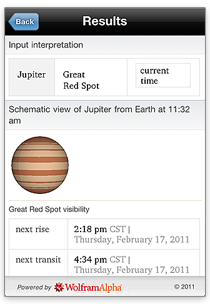 Good for students in high school or college, as they can have a good valid source of information that will help when they take a class in the fascinating subject of astronomy.